Locke the Cupboard was originally inspired by Locke’s idea that new born babies come into the world with a “blank slate” as a mind. I switched the metaphor to an empty cupboard for his status update and in doing so turned it into a double entendre. The empty cupboard represents both his learning theory and an actual empty cupboard in need of some canned goods. The obvious antagonist would be Plato so I tried to think of a clever way to refute Locke’s “blank slate” argument with something out of Plato’s “recalling what the soul had forgotten” playbook. I couldn’t resist the urge to evoke the Windows System Restore utility, as it is a tool that allows a Windows OS to revert back to a previous state. It might be a little bit out of context, but out of context is often the norm in the world of Facebook. I wanted to make Plato one of the main contributors to the conversation, but strangely enough I reached a roadblock. My brain took me in a different direction as I thought about how my girlfriend organized the can goods in my cupboard a few weeks back. She actually spent the time to group the soups together by type, and also PUT THEM IN ALPHABETICAL ORDER! Crazy as she is, it made me think of Gestalt theory. How something is organized affects how the learner perceives the content. 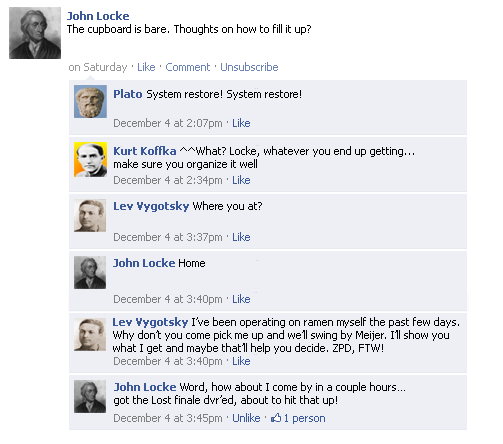 So in walks Koffka stressing that Locke organize his cupboard as he fills/learns. Then Lev Vygotsky jumps into the conversation to bring about a solution to the problem. Since Locke does not know what to put in his cupboard, Vygotsky offers to take him out to Meijer so that Locke can learn to shop by imitating him. Keeping with Vygotsky’s Zone of Proximal Development. But not until after he watches the final episode of Lost, a TV series in which one of the characters is named after him. Study Party @ Lev’s Place starts off with Lev Vygotsky making a status update letting all his “friends” know that he’s putting together a study party for CEP800. Vygotsky and Dewey are enthused about the opportunity to get together as a group and share their ideas so that they could learn from one another while Piaget, Plato, Locke, and Kohler would rather work individually. This status update attempts to illustrate the contrasting views amongst educational theorists about the role of the learner. The social constructivists (Dewey and Vygotsky) placed heavy emphasis on the role of society on the learner while theorists like Piaget, Plato, Locke, and Kohler depicted learning as something that happens to the learner as an individual. Dewey suggests that they ask the instructor if they could work collaboratively on their final project for the class (Ironically, by having this conversation they actually helped me to complete my project!) and the non-social constructivists chime in with opposition. This is obviously a gross simplification of the ideals that these gentlemen believed. However, I like that I was able to place these ideas into the context of a group project discussion. Anyone who has ever worked in a group in school or in their career on a project will identify with the different types of group members represented. Some people thrive while working cooperatively, while others would rather be an island. For a little added humor, the Behaviorists (Pavlov and Skinner) also make an appearance. Pavlov, being of the classical conditioning variety, acts like one of his dogs would and drools at Vygotsky mentioning the study party. Pavlov has been to Vygotsky’s study parties before and they had snacks there. The study party has become a conditioned stimulus that makes him drool even though Vygotsky makes no mention of snacks. Skinner simply inquires to the schedule that the snacks will be distributed, alluding to a reinforcement schedule. 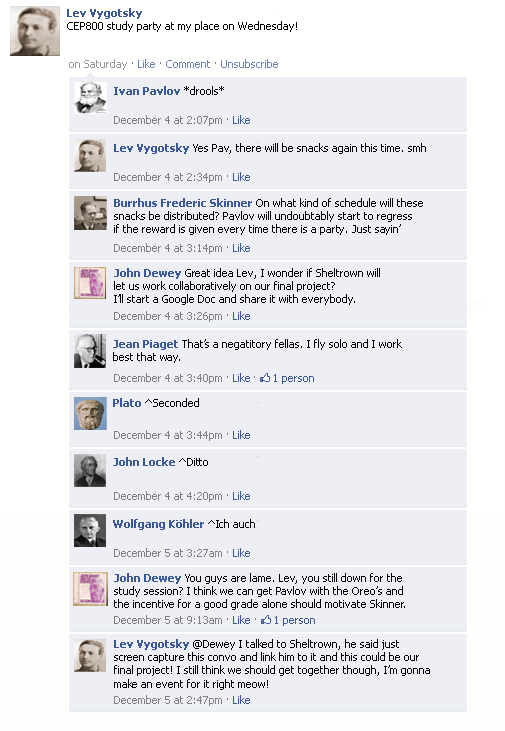 Attack of the Piaget Clones is a fake conversation between Piaget, Dewey, and Skinner. I imagined Piaget mentioning that Attack of the Clones was on TV that night so that everyone could tune in and watch. I think that I’ve treated Piaget unfairly in this parody but I couldn’t help myself. Every time I come in contact with his developmental stages, I think of humankind as a clone army. This is outlandish I know. It’s not so much the stages, but the sequential order that irritates me I think. Too rigid. 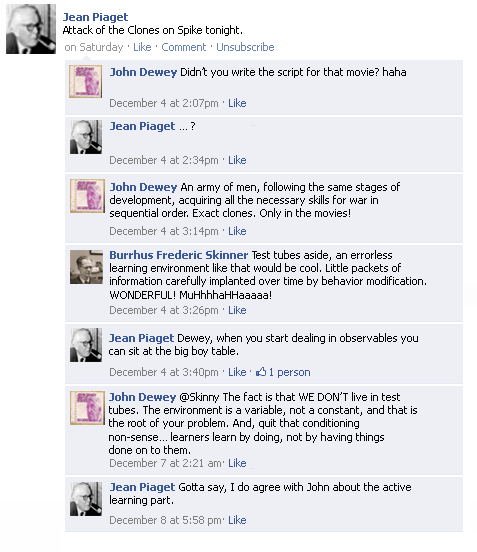 Anyways, Dewey pokes fun at Piaget’s movie choice because of the irony. Skinner chimes in about how the movie demonstrates a great errorless learning environment. Then the conversation shifts to active learning when Skinner mentiones “implanted”, something Piaget and Dewey would both disagree with since they believed learning was something that the learner did… not had done to them.